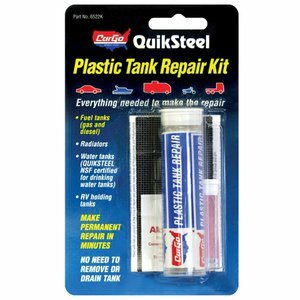 QuikSteel Plastic Repair Kit contains everything needed to makes permanent repairs in minutes without the need to remove or drain the tank. The Blue Magic brand was established in 1967 when Blue Magic Metal Polish was developed. This metal polish is recognized as the gold standard by car enthusiasts of all ages and was ranked number one over 31 other polishes for its ease of use, rust removal, gloss, and protection. The Blue Magic brand is carried on a wide range of cleaners and polishes. Blue Magic Carpet Stain and Spot Lifter, Blue Magic Leather and Vinyl Cleaner, Blue Magic Leather Conditioner, and Blue Magic Headlight Lens Restorer are each the number one product in their respective category.